Last week I released version 0.11.0 of Cosmoteer. It, and version 0.10.7 before it, add some significant new features and improvements to the game's user interface. If you play RTS games, you are likely already familiar with the basic concept. Your ships can only "see" so far away, and anything farther than your ships' sight range is hidden in the "fog of war". 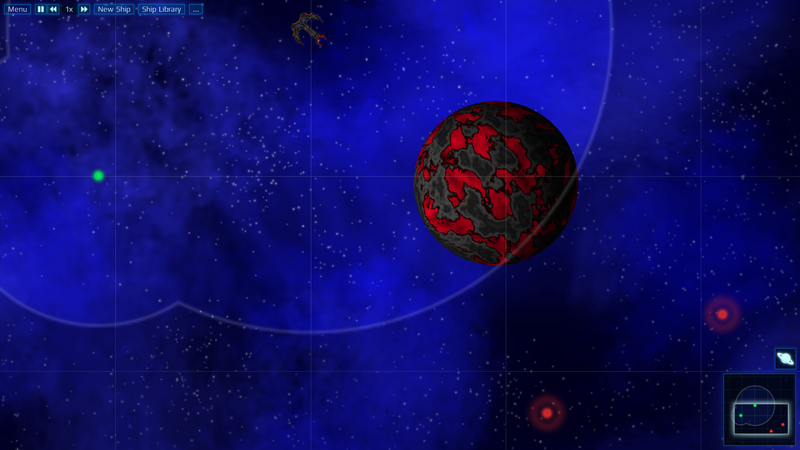 In the above screenshot, the darkened areas of the background indicate areas that are too far from your ships to see. 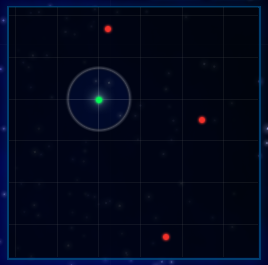 Currently, the locations enemy ships that are outside of your own ships' sight will still be indicated with pulsing red dots, which you can see in the lower-right corner. These tell you where you need to go to find something to fight, but offer no additional details such as the size or armaments of the enemy. The Fog of War changes gameplay, because now there's some risk involved in choosing to fight an enemy. It may turn out that the enemy is too powerful for you to defeat, and you'll need to run away. Occasionally needing to run away also has the added effect of making fast and maneuverable ships more important. The minimap is a long-requested feature that provides a simple overview of the locations of friendly and enemy ships. 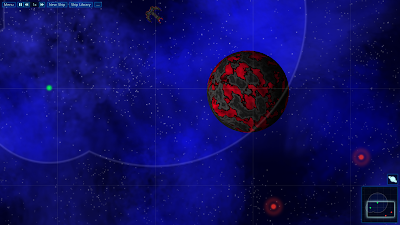 Unlike most RTS games which are played on a fixed-size battlefield, the playing area in Cosmoteer has no walls or borders and is infinite for all practical purposes. 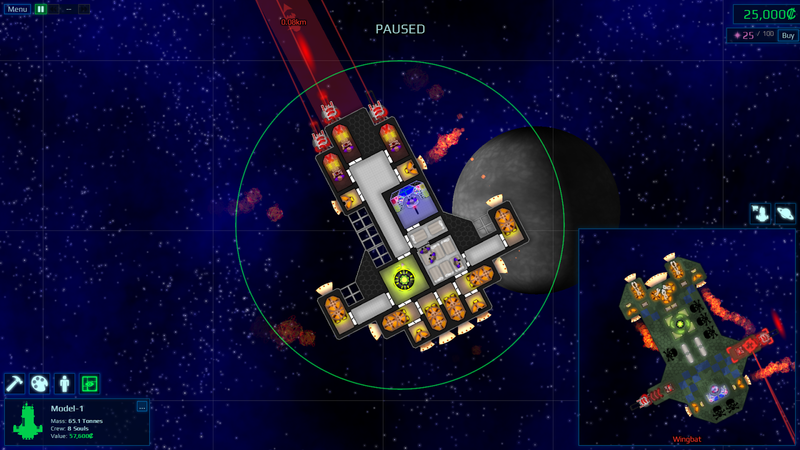 Therefore, the minimap automatically adjusts to show an area containing all of the ships in the game. The grid in the background always maintains the same spatial distance between lines, and so you can use the grid to estimate distances between ships. The miniview is basically a "picture-in-picture" view of a single ship, allowing you to view one ship in the main view and another ship in the miniview at the same time. My hope is that it solves one of the biggest usability problems that Cosmoteer has had up to now, which is that during combat you can't watch both your ship and the enemy ship at the same time without zooming out and losing a lot of the important simulation details. The miniview also isn't just for show, either -- you can also hover the mouse cursor over ship parts to see their health and right-click on them to target, all without having to move the main camera. The miniview is customizable, but by default, it is automatically displayed during combat and will show either your ship or the enemy ship -- whichever one you're not looking at in the main view. When displayed, the miniview replaces the minimap, which is generally less useful during combat anyway. Both the miniview and the minimap can be resized as desired to take up more or less space on your screen. Today I made a little gameplay trailer for Cosmoteer! Pretty much my first time putting together a trailer, so the editing and footage is a little rough.